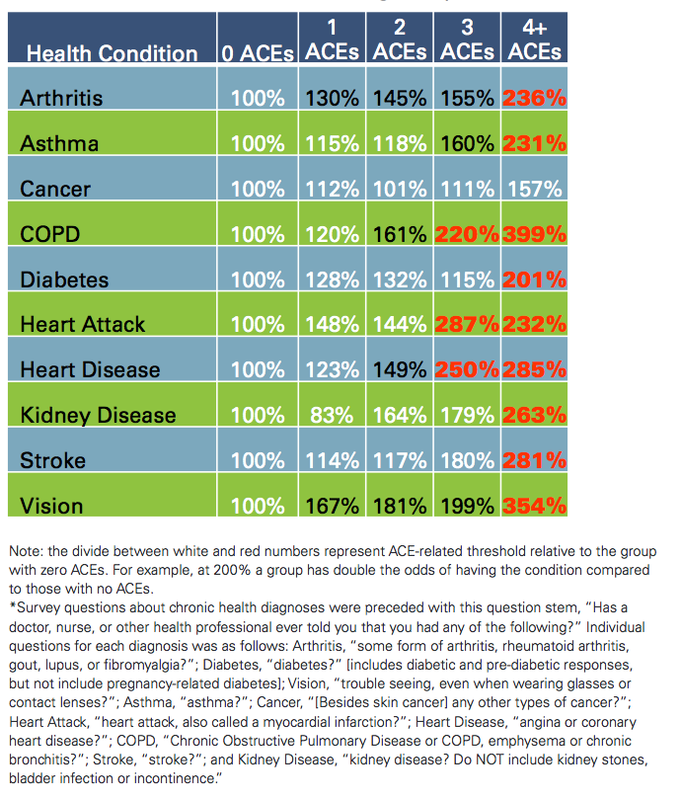 Most Iowans didn’t learn about the Centers for Disease Control’s ACE Study until early 2011. But in the three years since then, the state has completed two ACE surveys, one of them published, with a third survey underway and a fourth scheduled for 2015. Iowa has hosted three ACEs summits; two statewide summits in 2014 focused on ACEs in early childhood, and education and juvenile justice. And nearly every sector—including health care, education, social services and corrections—is busy answering the question: How do we integrate this knowledge into what we do? Robert Anda, co-principal investigator of the CDC’s Adverse Childhood Experiences Study. Anda was invited to give the keynote at the state’s annual Early Childhood Iowa Congress in 2011. Fielding those questions were Sonni Vierling, state coordinator for the 1st Five Healthy Mental Development, a project of the Iowa Department of Public Health, and representatives from the Polk County Health Department, Orchard Place Child Guidance Center, United Way of Central Iowa, and Prevent Child Abuse Iowa. “Data is what led the conversation from the beginning,” says Mineck. 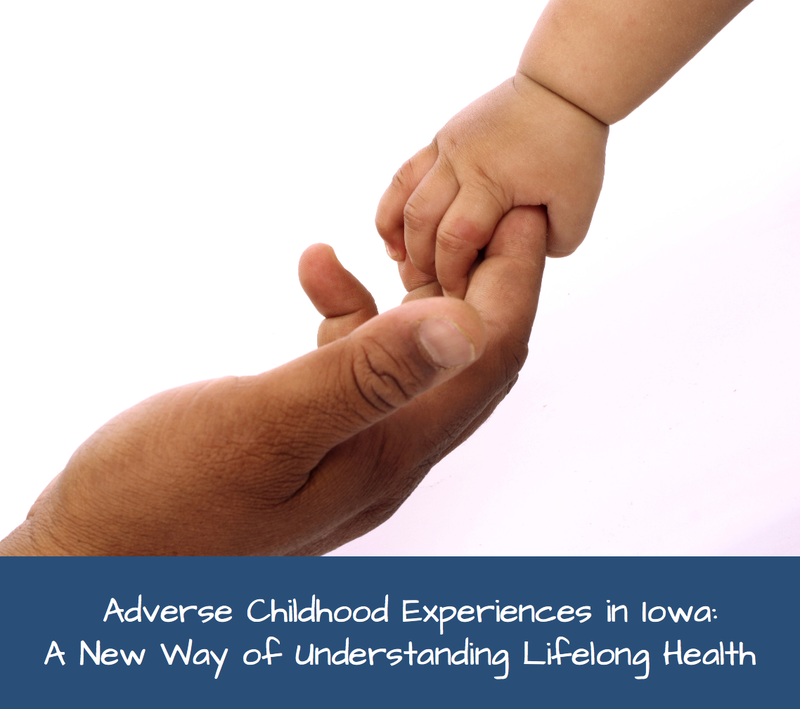 The CDC’s data plugged real science into what many on the front lines of health and social services already knew, but the numbers also begged the question: Does Iowa have the same incidence of childhood adversity? Iowa’s Department of Public Health was willing to include the ACE survey in the Behavioral Risk Factor Surveillance System (BRFSS) that all states use to measure rates of obesity, smoking, cancer, teen pregnancy and other health issues. But it would cost $24,000 to do the survey. The next step was to bring together a larger group of stakeholders, mainly to find out if other people shared the initial group’s conviction that the ACE Study and its implications mattered immensely. The group scheduled an invitation-only meeting for October 2011 and invited Anda for an encore presentation. About 200 people attended the state’s first ACEs summit. “We had identified around 30 department and coalition leaders,” says Mineck. They included representatives from the state’s health systems, community organizers, policy advocates, safety net providers, the United Way of Iowa, Visiting Nurse Services in Des Moines, 1st Five, research institutions and representatives from the domestic violence, substance abuse, and home visiting divisions of the state’s Department of Public Health. That was the beginning of the Central Iowa ACEs 360 Steering Committee, which included representatives from fifteen state and local agencies. Vierling became its coordinator. From there, the committee held a strategic visioning session to determine its goals and objectives. Their first priority was to educate, educate, educate….as many people as possible about ACE and neuroscience research. The group planned a second ACEs Summit for June 2012. It was free to attendees—some of the steering committee members picked up the cost—and open to anyone. Anda came back once again; another speaker was Laura Porter, former director of the Washington State Family Policy Council. The council had led that state’s efforts to disseminate research surrounding adverse childhood experiences and to foster a range of community-based, trauma-informed, resilience-building projects. The networking worked: 800 people showed up for the half-day summit. “Eighty percent of Iowa’s ninety-nine counties were represented, as were all different sectors,” says Vierling. People came from public health, human services, education, early childhood services, foundations, non-profits, law enforcement and criminal justice. The conference focused on ACEs 101: the epidemiology, the brain science and how organizations were turning the research into practice. In the months following the summit, participants took what they’d learned and began spreading that knowledge around the state. The Central Iowa 360 Steering Committee developed a web site with resources to support the effort. Pediatrician Nadine Burke Harris, founder of the Bay Area’s Center for Youth Wellness had breakfast with 30 health practitioners, gave a keynote address at the conference, then was whisked to Des Moines University for a lunch with more than 100 medical and nursing students. Porter, from Washington, who’d been invited for a second appearance, had breakfast with representatives from the Department of Education before giving her presentation to the 650 attendees. 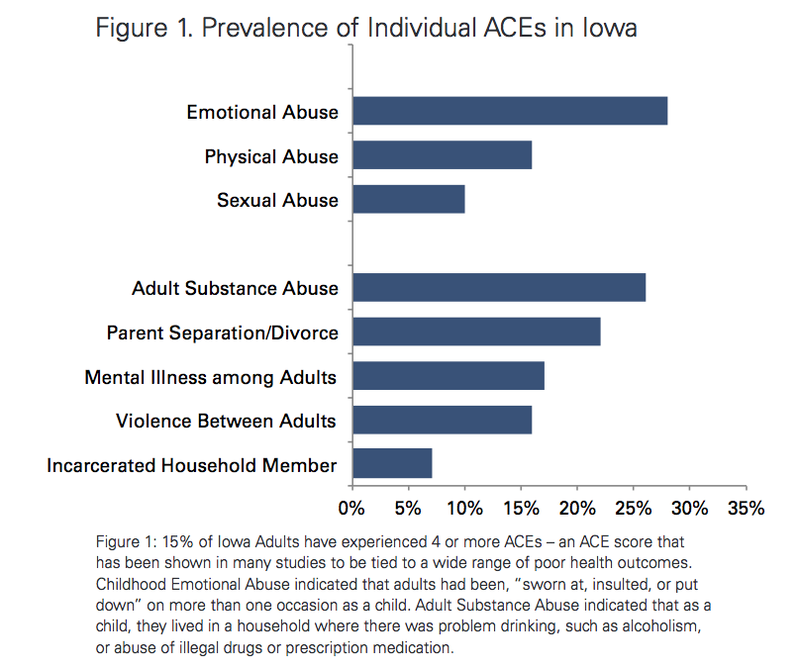 The steering committee also presented the 2012 Iowa ACEs data in a report, “Adverse Childhood Experiences in Iowa: A New Way of Understanding Lifelong Health.” The survey, whose findings were similar to the original ACE Study, showed that 55% of Iowans had at least one adverse childhood experience, while 1 in 5 of the state’s residents had an ACE score of 3 or higher. 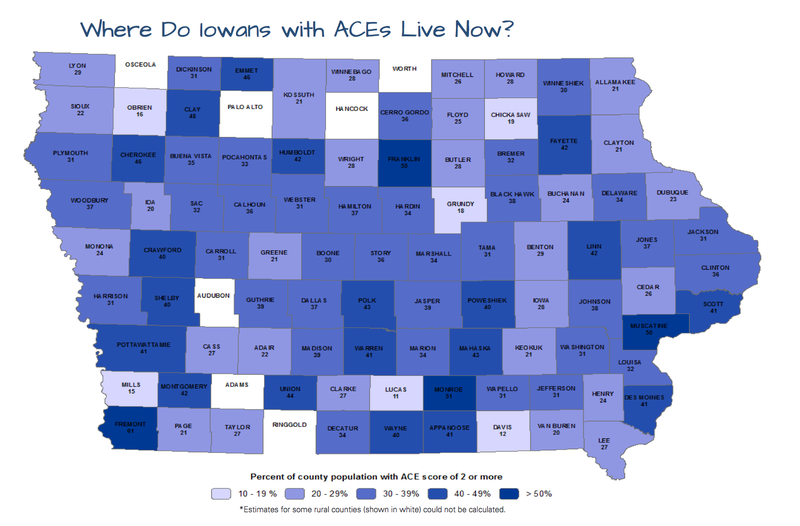 The report also included a county-by-county breakdown of ACEs. 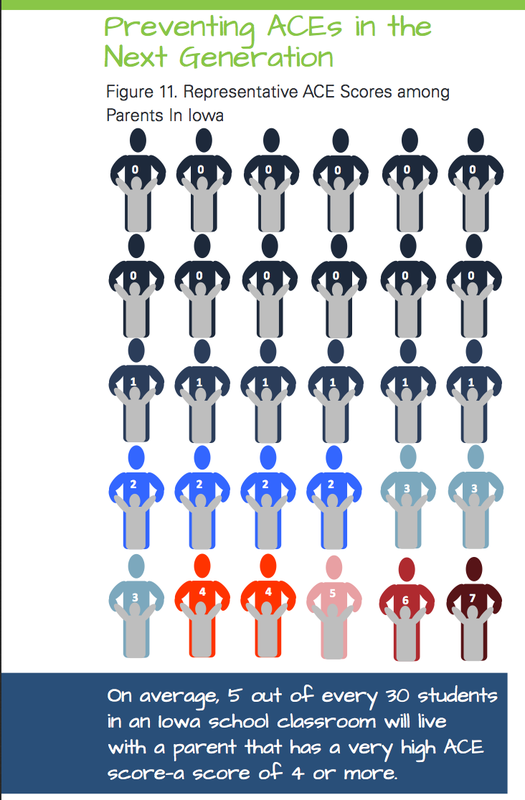 Among the telling graphics in the report was one showing that 5 out of every 30 students in a typical Iowa classroom lived with a parent who had an ACE score of 4 or higher. Children living with parents who have high ACE scores may be in situations of toxic stress; the kids’ behavior in school—acting out, withdrawing, failing academically—may indicate that they are under stress, too. In 2013, when the 2012 data was being analyzed, the steering committee learned that the CDC’s ACEs BRFSS module did not contain questions related to neglect, as the original study had. The 2013 data was already being gathered, but, working with Anda, the steering committee was able to identify and secure funding for six neglect questions to be included in the 2014 survey. The total cost for this year’s survey is $40,000. Iowa’s data has had a two-fold impact: The state-specific numbers are an affirmation of what many people already knew. And they are convincing legislators. Over the last two years, the steering committee has engaged people from other sectors, including representatives from a job-placement coalition for people with substance abuse and criminal backgrounds. “The impact of trauma was quickly recognized by the leaders of that coalition,” says Mineck, especially on why people with trauma backgrounds were having difficulty keeping a job. This article about the state of Iowa is one of several profiles of communities that are becoming trauma-informed. They are published together in the Community Resilience Cookbook. And although they don’t sit on the steering committee, the corrections, criminal justice and juvenile court judges are involved in the state’s ACEs conversation. The state corrections department is including trauma-informed practices in its mental health services for prisoners, with the hope that it will reduce recidivism. Prevent Child Abuse Iowa is staffing an initiative that is doing grassroots work to create community conversations around ACEs. The Iowa Foster and Adoptive Parents Association is making its entire curriculum trauma-informed. A Central Iowa trauma-informed stakeholders group is educating children and family support services workers on the impacts of toxic stress and appropriate trauma-informed practices. Des Moines Public Schools are beginning to provide training for teachers, administrators, support workers and staff around ACEs and trauma. United Way of Central Iowa is educating all of its agency organizations to become ACE-informed, to help them identify how the research connects with their mission and priorities. “There’s a lot of conversation around trauma in the Department of Human Services,” says Mineck. In 2013, news stories uncovered that a state-run facility was using restraint and seclusion irresponsibly. Some girls had been put in small concrete cells for a year, with only limited access outside. The center was closed. “The shining side of that tragedy is that there’s a pretty good conversation around trauma, now,” she says. The Mid Iowa Health Foundation is using the research to inform all of its grant-making. “Preventing or addressing adverse childhood experiences has become the lens to determine our current funding partners right now,” says Mineck. An organization for teen mothers is becoming trauma-informed; a homeless shelter is adopting the Sanctuary Model so that its entire organization operates with sensitivity to trauma and its impact. The health foundation has also helped support the development of an ACEs online module for adult learning, aimed at people who are working with vulnerable children and adults. 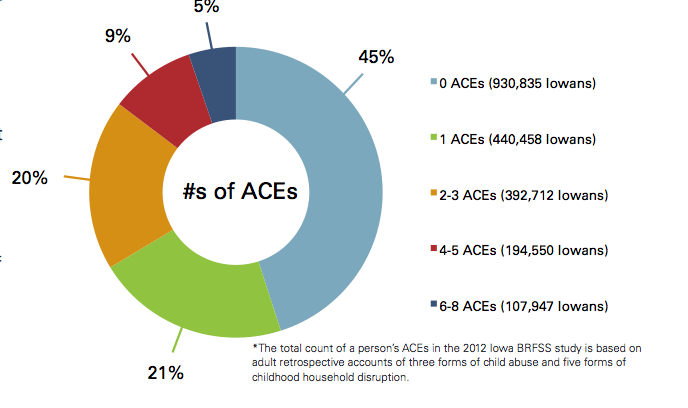 Prevent Child Abuse Iowa has also been doing a “Community-based prevention response to ACEs” initiative. Here is a link to that program. Two big questions stand out are: With what organization should the ACEs steering committee now live? And what is the role of the legislature in the state’s effort to prevent childhood trauma and change systems so that they no longer hurt already traumatized people? And although the legislature has been receptive to learning about the research around adverse childhood experiences, members keep asking for “the one thing” they should do. “That’s about impossible,” Mineck says. 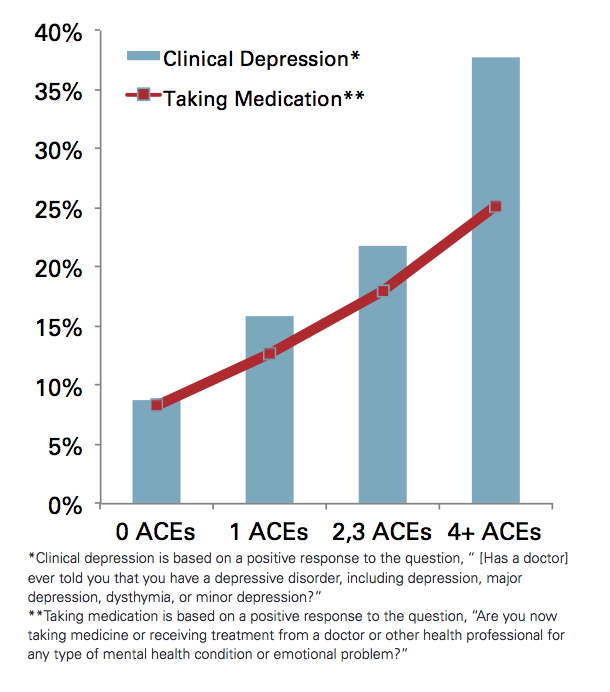 “The reality is the responses to ACEs are wide-ranging and long-term. We need to do a better job articulating to the legislature where those opportunities for impact exist.” So far, there’s talk about recommending that the Department of Education begin training teachers about trauma-informed practices. The Department of Corrections has asked the legislature for additional funding for trauma-informed mental health. And there’s a movement to start and fund a children’s mental health system. The message is working, says Mineck, because the legislature allocated $50,000 to cover the collection and analysis of a 2015 Iowa ACEs survey through BRFSS. The leaders represented a cross-section of sectors from the state. Hi Jane. Nice to see what Iowa’s doing ACEs-wise. They are the first state to be accredited as a Blue Zone (q.v.). Inspired by your posting about how Tarpon Springs, FL is turning themselves into a trauma-informed community, some friends and I recently agreed to meet with our local town council and put forth a referendum to turn our town into a hybrid – Blue Zone, Trauma-Informed, Authoritative Community. Here’s the link to the Powerpoint we’re using for the presentation to the council. If anyone wants a complimentary copy to use as a starting point to recreate for their own use in their own town, they can email me at the address on the presentation and I’ll be happy to send them one. Great article!!! I was talking aces in Carroll county and they are prevalent!! I saw that when I lived and worked there!